1. Preheat oven to 350˚F. Grease (9”x13”) baking dish with 1/2 tablespoon butter. 2. Spread pieces of baguette onto a baking sheet and bake for 6 minutes or until pieces of bread have just stiffened, but have not browned. Remove from oven and cool completely. Transfer bread to a large mixing bowl. 3. Place a large skillet over medium heat and melt 1 tablespoon butter. Add andouille sausage and saute for 3 to 4 minutes or until lightly browned. Transfer sausage to mixing bowl with toasted bread and place skillet back over stove. 4. Melt remaining butter and saute onion, garlic and butternut squash until butternut squash has caramelized and just cooked through, 8 to 10 minutes (adding 1/2 cup water to skillet and covering for a few minutes to steam, if needed). Add spinach and saute for 2 to 3 more minutes or until spinach has wilted. Generously season with salt and pepper. 5. Transfer mixture to bowl with bread and sausage and toss together. 6. Add 2 1/2 cups warm stock into mixture and toss together until well coated. Allow mixture to sit for about 30 minutes to absorb liquid. 7. Add half of the shredded cheese, adjust seasonings and pour into prepared baking dish. 8. Top with remaining stock, cover with foil and bake for 25 minutes. 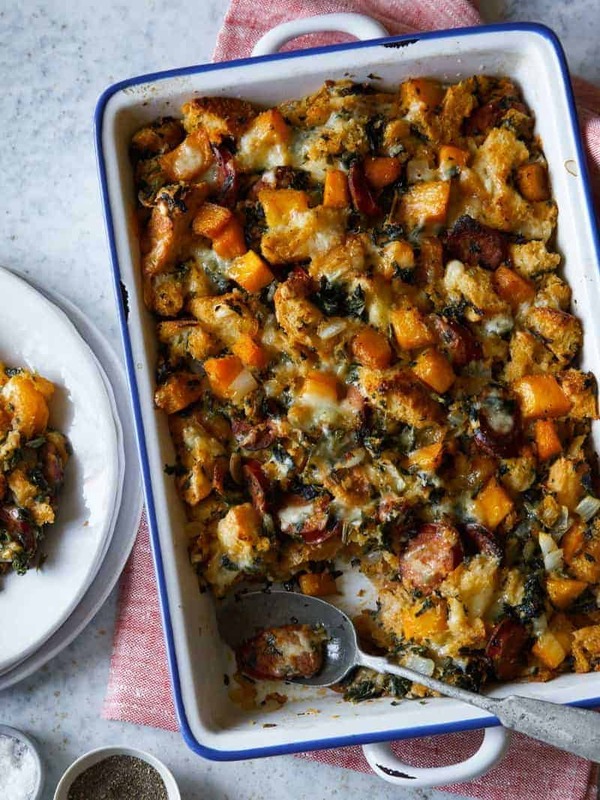 Remove foil, top with remaining cheese and return stuffing back into the oven, uncovered, for about 15 minutes or until cheese has melted and the top has browned. 9. 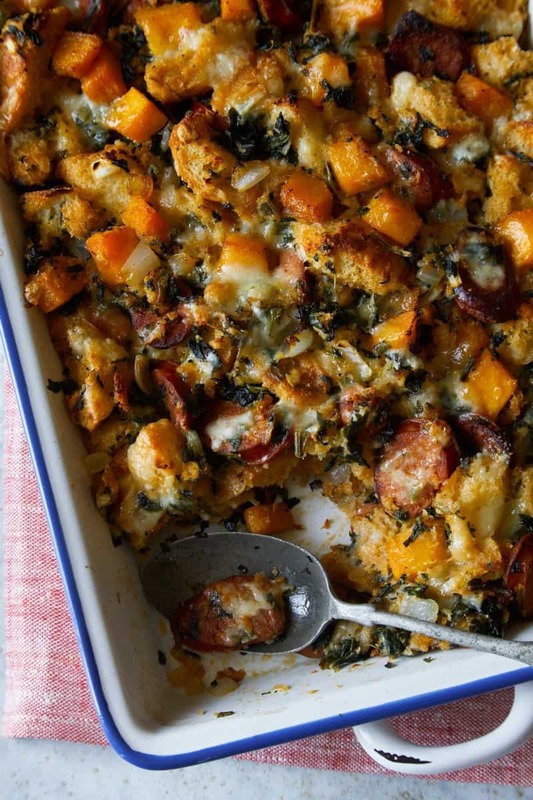 Cool stuffing, about 10-15 minutes and serve.